Both yellow and white zig zag road line markings generally provide motorists with instructions that stopping on parking on the zig zag line area is prohibited. 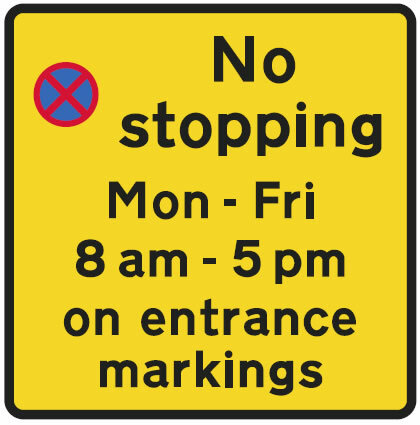 To enable legal enforcement and the ability to issue motorists with a Penalty Charge Notice fine (PCN), yellow zig zag road markings often found outside of school entrances and police, ambulance or hospital entrances, a sign must be in place close to the yellow lines detailing the restriction or times of restriction. Without the sign, yellow zig zag lines are not legally enforceable. See yellow zig zag lines for more information. White zig zag lines that are located at traffic lights and Zebra crossings however do not need a sign for enforcement. White zig zags lines are classed as dual enforcement restriction, this means the council can issue tickets to vehicles parked in contravention, likewise the Police can also issue to vehicles parked in contravention. The only difference is the Police fine also carries penalty points. You cannot park on these at any time. When were white zig zag lines first introduced? The white zig zag lines indicating to motorists ‘no parking’ were placed at either side of the Zebra crossings in 1971, they were then added to Pelican crossings much later during the 1980s. What do zig zag road markings mean? Yellow zig zag lines can be located outside of the entrances to schools, hospitals, police and ambulance stations and inform motorists that this area must be kept clear from waiting or parking. Especially important at schools, they offer children a clear view of the road when crossing as no cars will be parked in such areas the zig zag lines are located. White zig zag lines are placed either side of the pedestrian crossing areas at all UK pedestrian crossings. Prohibition of parking in the white zig zag area increases the safety of pedestrians crossing the road as they will have a clear view or the road in both directions. An unobstructed view of the crossing for motorists is especially important at zebra crossings and light controlled crossings where the lights have changed to green for the motorists but a pedestrian may still be crossing – this can be particularly relevant to the elderly who may take longer to cross or children crossing at an inappropriate time. Yellow zig zag lines that have a sign in place are enforced by the local council who have powers to issue motorists with a Penalty charge Notice (PCN) fine which is enforced as a civil matter and not criminal. A motorists is permitted to park on yellow zig zag lines outside of the times dictated on the sign. If no sign is present, the zig zag lines cannot be legally enforced. Penalty charge Notice fines for parking on white zig zag lines is in the higher region of £70 but is reduced by 50% if paid within the times displayed on the ticket. White zig zag road markings are enforced 24 hours a day, each day of the year and do not need a sign to enforce the no parking prohibition. Parking prohibition is enforced by local councils who issue a PCN and the police who will issue a endorsable Fixed Penalty Notice (FPN) and will incur 3 penalty points on the offenders licence. Road markings must be clear and in most cases follow a criteria for size, spacing and dimensions. A PCN or FPN can be withdrawn if the road markings do not comply with certain conditions. Illegal yellow zig zag parking is enforced by local councils by which a local authority order is in place by use of road markings a time plate sign making it illegal to park during the times show on the sign. If there is no sign present, it is not enforceable and as these a dealt with local council, action is civil and not criminal, therefore the penalty is not endorsable. Parking on zig zag lines, especially white zig zag lines if difficult to dispute a given penalty. Few exceptions are given. Disputing a penalty can result in tickets being cancelled if stopped because of an emergency such as helping a person who is injured for example. Unlike white zig zag lines, yellow zig zag lines found outside of schools, hospitals and police and ambulance stations must have a time plate sign accompanying the lines to be legally enforceable. Test your road markings knowledge. 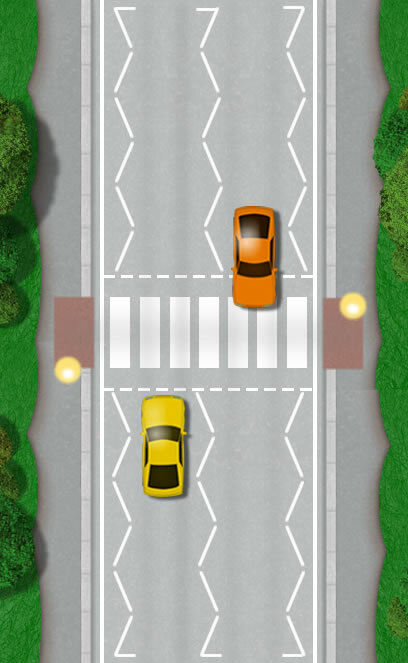 When you feel confident in your ability to understand road markings, take the free road markings theory test quiz and test your knowledge. See Road markings theory test quiz. The law applies to the carriageway only, but if a vehicle was parked in such a way to obscure the view of the crossing for drivers or for the pedestrians on the crossing, the vehicle owner may find themselves causing an offence of obstruction. Parking on pavements also has their own issues with the law, particularly in London where it’s prohibited.